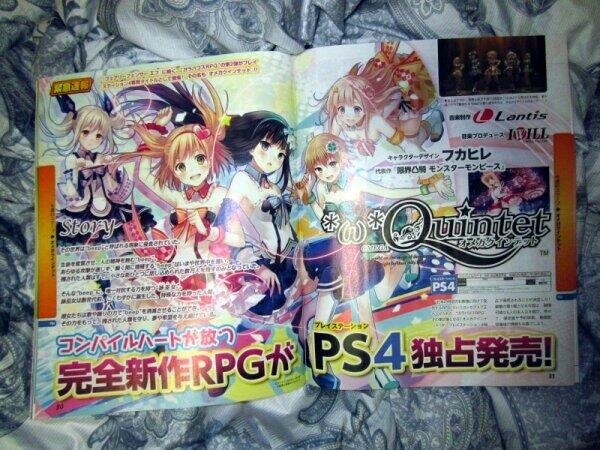 Japanese gaming magazine Famitsu has revealed that a new RPG is coming to the PlayStation 4 and it is called Omega Quintet. The game is being developed by Compile Heart that will indeed be a PlayStation 4 exclusive. The developers are calling the game a fantasy idol RPG that has a firm release date of of September 18th in Japan. If you’re wondering what the hell that means, they claim the story follows idols who are about to meet a mysterious creature that goes by the name of “Beep”. This “Beep” has the power to destroy peoples minds and the entire world. Sounds good! Below is an image showing the announcement of the gamin in Famitsu, which gives you a pretty good idea about what kind of genre this game falls into. I’m predicting the cheesy and zany genre with a few dark turns thrown in for good measure. Omega Quintet does not have an official release date for North America, though I’m sure something will be announced by or at E3. This entry was posted in All, Featured, News, PlayStation 4 and tagged Compile Heart, Omega Quintet, PlayStation 4 on May 8, 2014 by Mike Guarino.